The four sections of the Philology CRAI Library provide comprehensive materials for teaching and research activities in the subject areas of English Studies, Modern Languages and Literatures,Greek, Latin, Romance Languages and Semitic Languages, Hispanic Studies, Literary Theory, Communication, Catalan Philology and General Linguistics. 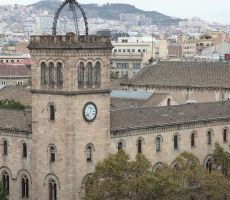 The historical collection of the library holds materials back to 1820, an encyclopaedic collection essential to the study of the history of this university and of the city of Barcelona. NOTICE: books on floors 1-3 of the Philology CRAI Library and Rare Book and Manuscript CRAI Library will not be available until further notice. Affected books appear in the catalog as "Not available"
Subject areas: philology, linguistics and literature (English and German, Classics, Slavic, Romance and Semitic languages), and media and cultural industries. Of special note: The 19th and early 20th Century (1821-1939) printed books and magazines collection, of diverse provenance, mostly from the former Industrial Property Registry and from donations.